We hear the weather will be picking up finally so if you are feeling energised, here are some fun outdoor and indoor events to make your week that little bit more special. With the sun tentatively tickling our noses now, a promise of warmer days spent on the beach is in the air. The National Maritime Museum is hosting a major photography exhibition celebrating Britain’s love affair with the seaside, featuring more than 100 photographs by Martin Parr, Tony Ray-Jones, David Hurn and Simon Roberts, as well as newly commissioned work by Martin Parr. The exhibition explores our relationship with the seaside over the last six decades and will hold up a critical and affectionate mirror to a much-loved and quintessentially British experience, captured by photographers who share a mutual love of the seaside. Vintage fashion can be a bit hit and miss in terms of quality but the Clerkenwell Vintage Fashion Fair is a treasure box full of carefully curated gems. 50 traders are selling unique pieces of womenswear, menswear, accessories and textiles dating from the Victorian era to 1990s, from little known-brands to pre-loved designer labels such as Chanel, Dior, Burberry, and Vivienne Westwood. In its 9th year now and a well established as a top destination with fashion lovers, industry insiders and costume designers, the fair has this year moved to the Freemasons Hall Covent Garden and the Spring edition on 22 April has a special treat up its sleeve: the Concordia Foundation 'vintage fashion & costume collection' founded by international singer and broadcaster Gillian Humphreys will be hosting a sale of spectacular garments once worn by Gillian Humphreys, from daywear and eveningwear to unique pieces from some of the most prominent costume and fashion designers. Clerkenwell Vintage Fashion Fair is taking place on 22 April at the Freemasons’ Hall, 60 Great Queen Street, WC2B 5AZ. Tickets £5. The Independent Filmmaker’s Ball, the fundraising gala for the Independent Film Trust presented by Raindance, will be back in London at the Café de Paris. This year, Raindance rolls out the red carpet for a Tiki Night Special, inspired by 1960’s rock & roll and surf films. 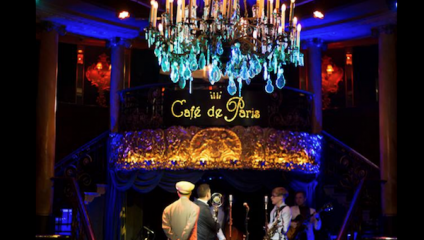 The Ball promises to be a wild night of music and celebration at the art deco-inspired Cafe de Paris. Party-goers will be swinging to the live big band sound of Natty Bo & The Top Cats, and there will be a charity raffle with top prizes and celebrities in attendance. All proceeds from the raffle go to Raindance’s charity arm, the Independent Film Trust, towards a collaborative project called 25x25 to support under-represented from diverse groups and offer opportunities to bring under-represented film artists into the industry. The Independent Filmmaker’s Ball takes place on 18 April at café de Paris. Tickets are £18 on early-bird price, £21 general access, or £16 for Raindance Members. All tickets are available through the Raindance website. To celebrate St George's Day, Borough Market is hosting a family-friendly day filled with food, music, storytelling and theatre to celebrate the Turkish born Roman soldier’s influence around the world. Packed with the very best of English produce—from Colchester oysters and Tamworth beef to Melton Mowbray pies and Cheddar cheese – the market will celebrate Saint George’s international status as the patron saint not only of England, but of Georgia, Ethopia, Greece, Turkey, and Catalonia with traditional food delicacies from around the world. Visitors will get the opportunity to sample unique St George’s day products and take part in traditional (with a twist) Saint George’s Day entertainment such as Maypole dancing. The National Farmers Union will be hosting a Discovery Barn where 4-9 year olds can learn about food provenance and the hard work British farmers do through a series of games, colourful interactive information panels and fun activities. April 21 is National Tea Day and to celebrate the quintessential English drink, Chiswick House is joining in with a Tea Festival. Did you know that when Chiswick House was reaching completion in 1729, tea was the most fashionable refreshment in England? Having been introduced to this country in the 17th century, when it was drunk for its supposed medicinal properties, it became a symbol of luxury and status. Until 1784, tea was subject to heavy taxation making it an expensive commodity, only to be enjoyed by the wealthy like Lord and Lady Burlington. Of course, tea is not just history, and there will be lots of celebrity bakers, music, and mixology masterclasses at the Tea Day Festival all weekend. The Royal Shakespeare Company will be auctioning more than 50 items of costume and armour on eBay. The online auction will go live on 17 April at 8pm and end on 27 April at 8pm selling costumes worn by actors including Simon Callow, Ian McKellen, Patrick Stewart and Antony Sher. How do you feel about owning David Tennant’s black trousers from Hamlet (2008) or Judi Dench’s doublet and hose from Shakespeare Live! (2016)? Each costume comes with a certificate of authenticity. All proceeds will go towards the Stitch In Time campaign supporting the restoration and redevelopment of the Costume Workshop and help continue to create stunning costumes for audiences around the world to enjoy. To bid, click on the link to the eBay auction provided on the RSC website from 17 April.